Edward Stanton, sometimes spelled Staunton, was born about 1641, his parentage and place of birth still undiscovered. He was apprenticed in December 1655 through the Clockmakers' Company to Francis Bowen of Leadenhall Street, London, a former journeyman of William Bowyer also of Leadenhall Street. William Bowyer was a famous and prolific maker of lantern clocks. Francis Bowen had been apprenticed to William Bowyer from 1647, and it was not until after Bowyer had died about 1653, that Bowen took up his freedom (April 1655) presumably to be able to trade in his own right, perhaps even continuing in the same Leadenhall Street premises of his late master. Between 1658 and 1662 Edward Stanton, at this time still an apprentice, was transferred to another master, probably on the death of Francis Bowen, namely to Nathaniel Allen, who had only recently (about 1658) become a member of the Clockmakers' Company and was also a former apprentice and workman in the William Bowyer workshop. Many fine lantern clocks are known by Bowyer, one or two by Francis Bowen, none by Nathaniel Allen, who died shortly after 1662. Edward Stanton should have finished his term of apprenticeship by December 1662 and he was freed from his apprenticeship through the Company at the next meeting in January 1663. He too worked in Leadenhall Street, again perhaps in those same premises. Bowyer, Bowen, Allen and Staunton clearly liked the location and stayed with it. It proved to be a wise choice, as in 1666 the Great Fire of London stopped just short of Leadenhall Street! Stanton worked in London, probably at these same premises, for over half a century. Those who trained him, and the man who trained them, made nothing but lantern clocks. 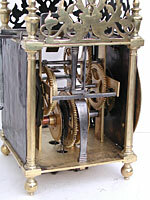 But Stanton also made longcase and bracket clocks as well as lantern clocks, of which latter I have details of ten. All the lantern clocks of his that I have noted were made with a short verge pendulum, most later converted to anchor escapement and long pendulum to improve timekeeping. Most were built with alarms, which were usually removed on conversion to long pendulum. They are variously signed 'Edward Stanton in Leaden Hall Streete, Londini', 'Edward Stanton Londini', or 'Edward Stanton London'. A lantern clock by him is pictured in Clocks Magazine June 2001 p.36. Naturally there is some variation in the design and style of his clocks over his long working period. And yet many of his lantern clocks look very similar to each other, which is perhaps not surprising if he engraved his own dials. 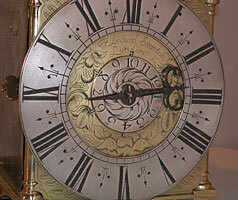 We seldom know when a clockmaker was also an engraver, as many would have sent their work out to specialised engravers. In Stanton's case we can guess that he may well have done his own engraving , as we know he was also an engraver. 1. This dial is dominated by a bold display of tulips. Strong fleur-de-lys or trident half-hour markers. Original alarm disc. Original iron hand. Date 1680s. We know this because in January 1674, then aged 33, he was accused, as is recounted in the Clockmakers' Company records, of having erased Henry Jones's name (Jones was then aged 39) from a royal clock and having illicitly engraved Robert Seigniour's name on it instead (Seigniour was then aged 29). This is the same Robert Seigniour who had been fined by the Clockmakers' Company in 1671 for calling them a 'company of cheating knaves'. They did not say why he had called them that, but these documents only record the Company point of view. The precocious and enigmatic Robert Seigniour must have had friends in high places for later in that same year (August 1674) he became the 'King's Clock and Watchmaker without fee' until the death of, or surrender of office by, the present holder, Edward East. East was then aged 72 and was never likely to relinquish office while he could draw breath. It must have seemed to Seigniour that East was determined to live for ever. But this accusation of skulduggery tells us that even before he was appointed to the Royal office, Robert Seigniour had official access to, was working on, and maybe tampering with, the King's clocks. The appointment is quoted in full by R. W. Symonds in 'Thomas Tompion his life and work': By a warrant of 1st August 1674 he was appointed "in the place & quality of Watchmaker and clockmaker for making & mending of His Maties watches and clocks in Ordinary wthout ffee until the Death Surrender or other Determinacion of Edward East And then to enjoy the same places with fee together with all other profitts allowances & priviledges therto belonginge in as full and ample manner as the said Edward East or any other person whatsoever." There is an old story, I don't know where it came from, that when Edward East was clockmaker to Charles I, the King's son, the Prince of Wales, would regularly give one of East's watches as a prize at tennis matches. This seems extremely unlikely not least because, as the late Alan Lloyd pointed out in his book 'Old Clocks', the future Charles II was sent abroad in 1646 at the age of 16 and did not come back to London till the Restoration of the Monarchy in 1660. In fact East was clockmaker to Charles II, not Charles I.
Edward East, who had held that office of Royal Clockmaker 'with fee' since 1660, in fact lived to be 95 years old, dying in 1697, the grand old man of the Clock World, whereas Robert Seigniour died ten years before him aged only 42. East even outlived his old and ultimately more famous rival, Ahasuerus Fromanteel, who reached a mere 86. So Seigniour was never to become Royal Clockmaker 'with fee'! If 95 seems elderly today, in those days it must have been incredibly ancient and to survive to such an age a man must have had the constitution of a horse. In fact East seemed so amazingly old to others in the trade that in 1671, when the Clockmakers' Company applied for a coat of arms he was described as "Edward East, the only person now living of those mentioned in the said Letters Patent of Incorporation", that is the Clockmakers' Company charter of 1631. And he was to last more than a quarter of a century longer yet! 2. The engraving shows more clearly in this closeup. The dial centre design is based on tulips, which are typical of this period. Note the 'w' in Edward looks rather like an 'n', which is typical of the script of the period. Finely sculpted original hand. We will never know whether or not Edward Stanton faked Seigniour's name. It was a very strange accusation for Henry Jones to invent if it was not true, for it must have been possible to prove who made what. But we do we know at least that his engraving was so skilled that even his accusers considered him a likely candidate to be employed for engraving work by the Royal Clockmaker in waiting. We can probably assume therefore that he engraved his own clock dials. The ten lantern clocks I know of by him are mostly very similar to each other. His life has proved very elusive as those searches I have done have almost all failed to find a result. What we do know about him comes almost exclusively from the records of the Clockmakers' Company. I suspect he was a nonconformist, as I seem to be able to find nothing in parish registers which I can be sure relates to him. Nonconformists were obliged by law to marry in church, apart from which they were often keen to be sure their marriages were set down in acceptable public record in case of any arguments about legitimacy or inheritances. As to baptising their children, they could take whatever view they wished about that, and some did not believe in baptism, though they may have been punished for non-attendance at church and ostracised for not baptising their children, except among their own kind . So there may well exist somewhere an entry of his marriage details. An Edward Stanton was married in 1667 to Lucy Price at Holy Trinity Knightsbridge, London. Another was married in 1674 to Sarah Philpott at St. Mary Magdalen Old Fish Street, London, but I have no way of knowing whether either of these relate to the right Edward Stanton. There were other clockmakers called Stanton, some of whom might have been related. Most of them were later than Edward but one was his contemporary - Reginald Stanton. His name is sometimes mistakenly written as Original and some reference books show both an Original and a Reginald, but he was one person not two. I was able to learn that Reginald was born about 1638, son of Edmund and Lucy Stanton of Stoke Hammond, Buckinghamshire, a gentleman, and was apprenticed through the Founders' Company 20th March 1652 to Henry Thomas. He took an apprentice in February 1662 in the Founders' Company named William Lucas, son of Robert Lucas of North Mimms, Hertfordshire. William Lucas was later transferred to other members of the Clockmakers' Company and made free in April 1669, which was quite contrary to the rules and a meeting was called in 1670 to discuss his wrongful admission. In 1662 Reginald was on the Clockmakers' Company list when they carried out a census of all known clockmakers, his name written incorrectly again as Original. Just what he did in the clock trade remains unknown as no clocks or watches are recorded as having been made in his name. He appears to have left or ceased trading before 1669. Why he should be recorded by the Company as clockmaker is not clear, especially as he never joined the Company, nor did they ever try to coerce him into joining, as they would with most clockmaking non-members. Nor is it clear how he got his apprentice transferred from the Founders Company to a member of the Clockmakers' Company. This was all very irregular and if the Company had set their discussions onto paper in 1670, we might know a lot more about Reginald and perhaps Edward too. 'Original' Stanton was married on 28th Jun 1663 to Mary Hayward at St Mary the Virgin Aldermanbury, London, the same Reginald but still they spelled his name wrongly. Initially I thought that looking into his background might throw light on Edward Stanton, and there were vague indications that they might be related. They were of the right age to have been brothers, but I have no proof that they were. However if they were brothers this might help explain why the Clockmakers' Company were tolerant towards Reginald. Some of the other Stanton clockmakers were also connected to the Founders' Company and others to the Price family, but these leads were a bit too thin to be worth pursuing and Edward's origins remain unknown. 3. Bold, deeply-curved and decorated hammer spring and decorated hammer stop. Replaced backplate. The alarmwork (and spurs) would have been on the original backplate, and was no doubt removed when the escapement was converted from verge to anchor to improve timekeeping. Steeply tapered arbors without collets. Over the years Edward Stanton took several apprentices of his own. These were: William Cattell from 1665 to 1672, Stephen Wilmott 1667 to 1674, Samuel Stevens 1671 to 1680, William Newton 1676 to 1686, John Kirk till 1678, Thomas Watts 1681, John Strangfellow 1682 to 1691, Samuel Winter 1683, William Cottrill 1687, Underwood Lee 1689, Thomas Leach 1696 later passed on to Michael Shields, Alexander Reid 1698 to 1707, Samuel Leach 1701, Thomas Healy 1705. Of these fourteen William Cattell and John Strangfellow themselves became makers of lantern clocks, though Strangfellow moved away to Yorkshire. William Cattle worked on his own account in Fleet Street for some years. Several lantern clocks are known by him, including one with the date 1671 behind the alarm disc, when he was still officially an apprentice. Cattle died in the autumn of 1688 aged only about 38. Edward Stanton, then aged 47, was one of the witnesses to his will, evidence that the two men were still in close touch. In January 1689 Stanton offered to borrow at an interest rate of 4% the sum of £500, which the Clockmakers' Company were looking to lend out, but his offer was declined. We don't know why. In the Clockmakers' Company Stanton was made an Assistant from 1682, a Warden from 1693, and became Master of the Company aged 56 in 1697, a year during which John Ebsworth, another prolific maker of lantern clocks, was also Master. Two years later, in 1699, Edward Stanton was named as one of the overseers to John Ebsworth's will, the latter dying in that year aged about 56. Stanton was 58. An 'overseer' was appointed to ensure the deceased's wishes were carried out and was usually a trusted friend or relative. We know of no business connection between them, though they would have shared the same responsibilities in the Company about the same time. In March 1702 Stanton had an illness, its nature not explained, though he continued to attend Company meetings after that. Then, quite abruptly, he ceased to attend after 1715, when he probably died. His age then would have been about 74. His burial has not yet been traced. So there is still a lot to discover about Edward Stanton, but then that is one of the pleasures of research into these early clockmakers, that it is never finished! Footnote: An extended version of this article was published in Horological Journal.